kc bob: Unconstitutional Day of Prayer? "I understand that many may disagree with that conclusion and some may even view it as a criticism of prayer or those who pray. That is unfortunate. A determination that the government may not endorse a religious message is not a determination that the message itself is harmful, unimportant or undeserving of dissemination. Rather, it is part of the effort 'to carry out the Founders' plan of preserving religious liberty to the fullest extent possible in a pluralistic society."" The case was filed by the Freedom From Religion Foundation, a Wisconsin-based group that challenged the constitutionality of a 1988 law giving the president authority to designate the first Thursday in May as National Day of Prayer. I am not a regular participant in the National Day of Prayer.. I do not meet with other Christians on that day and pray.. frankly I probably do not pray any more on that day than other days.. maybe this year will be different though? I do think that it is a good idea.. the bible instructs Christians to pray for those in civil leadership. And I think that it is a good way to informally unite those who pray in a formal way. In my opinion the judge has interpreted the establishment clause in a very biased manner. My understanding of it is that it simply says that congress shall not interfere in the practice of religion and shall not establish a national religion.. like "The Church of England". The National Day of Prayer was instituted by Congress in 1952 and in 1988 was set on the first Thursday of May. I see no reason why this legislation was unconstitutional then or now. What do you think? Do you participate in the Day of Prayer? Do pray with others? I do not participate in the National Day of Prayer. But, I am concerned about this ruling. I agree with you that the purpose of the separation of church and state was to prevent the government from establishing a national religion, not to drive all religious observance out of public life. The national day of prayer is promoting religion but not a particular religion. 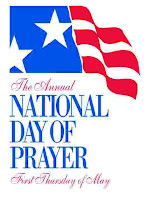 The National Day of Prayer is the government establishing a religious practice. Saying that is different from establishing a religion is splitting hairs. It also promotes theistic religions over non-theistic ones (like certain forms of Buddhism and paganism). It'd be like a "National Day of Auditing (http://en.wikipedia.org/wiki/Auditing_(Scientology))" or "National Day of Crystal Healing". Both establish a preference for certain religions via endorsing their particular practices. The fact that prayer is a popular religious practice doesn't make it any more constitutional. That being said, I din't think having a National Day of Prayer is that big of a deal. Sure I hate that some of my tax money is being used to fund events related to the day but there are much bigger fish to fry. My preference would be for believers to spontaneously organize and self-support the day's activities similar to the way Catholics celebrate Lent. That way you still have your National Day of Prayer without government involvement. I hear what you are saying Sid but what part of the constitution do you think is violated by the National Day of Prayer? It does not establish a particular religion (like Catholicism), or even a specific way to pray, which seems to be the intent of the establishment clause. I see nothing unconstitutional about it. It is a violation of the Constitution. The issue is not that the government is denying Christians the right to pray. The issue is that Christians want the government to recognize and honor their beliefs. Pray in school all you want - don't ask the school to institutionalize prayer. Pray anywhere and anytime you want to any God - do not ask the government to establish a place, a time and your God for that purpose. The Constitution does not limit any person's right to worship as he/she wishes. The Constitution does not limit any person's right to proselytize as long as the civil rights of the target of the proselytizing are not violated. Far more Christians are concerned about the abolishment of institutionalized prayer in school than attend prayer meetings at their own church. Sounds like hypocrisy to me! In response to Brian: the Constitution prohibits the government from promoting religion not just a particular religion. A citizen may disbelieve in religion - all religions. If the government establishes a National Day of Prayer it will do so only at the expense of all taxpayers. That violates the rights of the citizens who do not believe in religion. In fact, when the government established Christmas as a federal holiday it violated the Constitution. I don't expect the government to drop Christmas as a federal holiday since it has become less about Christ and more about Gift Receiving. Lobbyists would make a fortune fighting to maintain Christmas as a federal holiday but most of them would be representing the retail industry whose profitability often hinges on the degree of our "Christmas Spirit." Appreciate the differing views. It does look like President Obama will be recognizing the day as he did last year. "I call upon Americans to pray in thanksgiving for our freedoms and blessings and to ask for God's continued guidance, grace, and protection for this land that we love." National Day of Prayer can encompass any kind of prayer. Right? Muslims can pray on that day. As can Jews, and probably a whole lot of other religions. What's wrong with Christians (and any others who want to) doing that in an organized way? God is a big God. I'm sure God hears the prayers of a whole lot of different kinds of people. And I'm sure atheists and agnostics retain the right not to pray. National Day of Prayer unconstitutional? No matter what the court says, I doubt it.